Fields of Fire 2nd Edition – squad goals. I love getting a notification that a package is waiting for me. I spend the rest of the day trying to predict which of the pre-orders or Kickstarters I’ll be opening when I get home. Delicious anticipation. Late last week , though, when the concierge brought out my delivery (I live in one of those kinds of buildings), I saw it was from GMT Games. Huh?? What the heck? I never preorder from those guys; they charge a gazillion for shipping and the extra few days I receive it ahead of the stores is never worth it. And then I remembered: Fields of Fire, 2nd edition upgrade pack. Previously (here, here, and here) I’ve mentioned my lifelong devotion to conflict simulation (consim), or wargames. 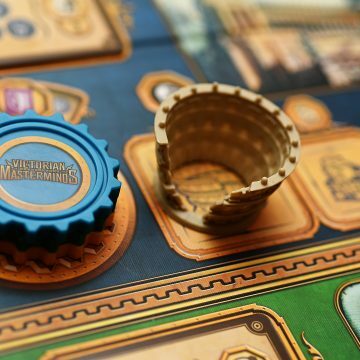 It’s no coincidence that I included several of them in my list of great solitaire games, because growing up in those pre-Internet days it was very hard to find opponents, or even people who had heard of these kind of games. Plus, the designer in me is fascinated with the challenge of constructing an AI out of cards, cardboard bits, pencil, and paper. So in 2008, when I wandered into one of my FLGSes and saw Fields of Fire on the shelf, I was very interested. In the game you play a US rifle company commander (or, well, a series of them) through three wars: WWII, Korea, and Vietnam. This is a very ambitious concept considering the evolution of arms and equipment, the different terrains, and the very different combat styles of the opponents. Instead of a paper map, terrain is represented by cards, each representing a section of land which could be open, wooded, or village…d. 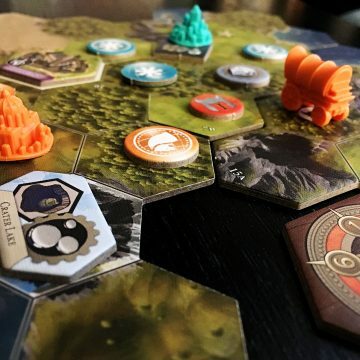 Changes of elevation are handled by hill cards, which can literally be stacked to represent higher and higher terrain. Squads can (and should!) seek cover on a card, but it’s not automatic. 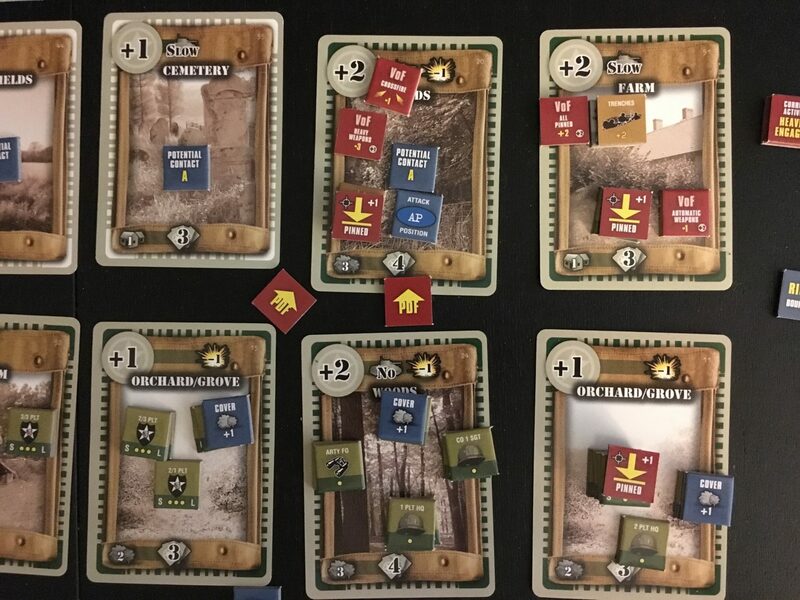 The great thing about using terrain cards was how you could create your own battlefields, or flip them over, shuffle, and deal them out to represent lack of reconnaissance. The game system is all about fog of war–from the variable amount of command points you have to spend each round to activate units, to the way enemies emerge and get spotted, to the tension between needing to spread your soldiers out to maintain a front and outflank your enemies and the difficulty that causes in staying in contact with them. 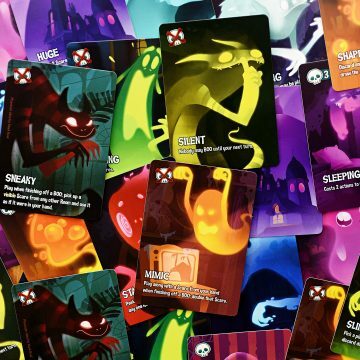 Finally, random events are resolved not through dice but through a special card deck covered in icons and numbers. 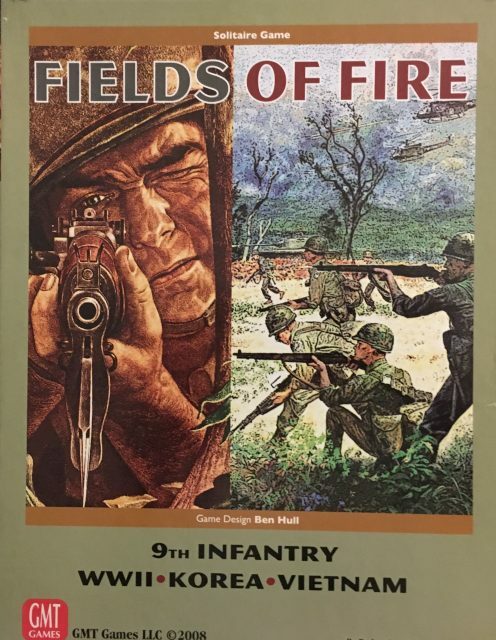 The whole thing reminds me of Up Front, a 1983 game which was ahead of its time in its card-driven play–but with Fields of Fire, you don’t have to wait for an opponent! Yup, I snapped it up, despite the fact that my lifestyle was no longer as conducive to learning and playing games like that. By which I mean I was married with a small child and had a full-time job. Not a lot of spare time to play games in general, let alone something like this. Fields of Fire’s main rulebook (there were also two “briefing books” with scenarios) was over fifty densely-packed pages and had a turn sequence that read like the outline of someone’s PhD thesis. Its innovative system of PDFs (primary direction of fire) and VoFs (Volume of Fire) set it apart from the usual hex-and-counter games I’d grown up with. 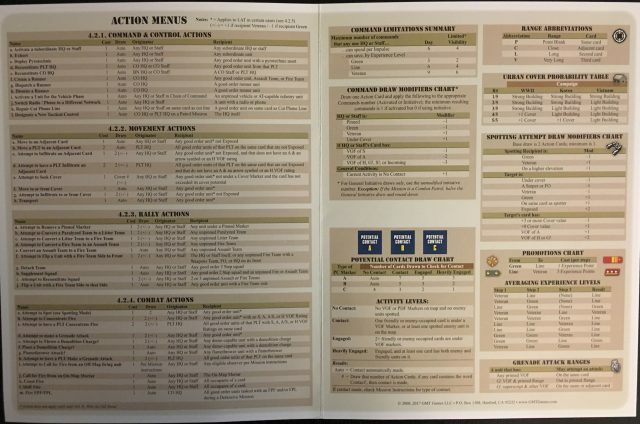 There were entire rule sections devoted to “command and control”–keeping your units in contact with their platoon and company HQ’s. Just figuring out how to set the damn thing up wasn’t easy, despite an example of play. The rules were not intuitively organized. I was used to reading big rules books for wargames; I’d taught myself Third Reich at ten). But the Fields of Fire rulebook was a mess. Rules for grenades, for example, were spread among three different parts of the rules, with no cross-referencing. Plus there was quite a bit of errata–which, thanks to BGG and grognard.com (my used-to-be go-to for all things wargamey) I was able to correct before playing. There are currently 1,200 threads in the BGG rules forums. And there were whole sections of rules which just didn’t make sense. There were references to using coloured flares and smoke to send signals to your troops–but no specific mention of how it worked. There were three types of scenarios: offensive, defensive, and patrol. The offensive scenarios were the easiest to manage–when you entered enemy territory, you figured out whether you had stumbled on something, then specifically what you had found, and then where the bad guys were lying in wait. Then everyone started firing. Defensive missions were a little trickier, because now the enemy were heading toward you and therefore generating their actions required more work. But the rules for patrol missions simply made no sense. In theory, your guys were wandering back and forth between set positions but could somehow be set upon by baddies…it was, all agreed, quite a hash. Luckily, the consim community is a resourceful and resilient one, and gamers came forward to plug in the gaps and reorganize the rules. The general feeling out there was that this was a brilliant design, but that GMT had seriously dropped the ball in the development stage. In the meantime, though, after a few playthroughs of the first few Normandy scenarios, I moved on to other things, hoping that a new edition would streamline things and make the game more playable. That only took nine years. 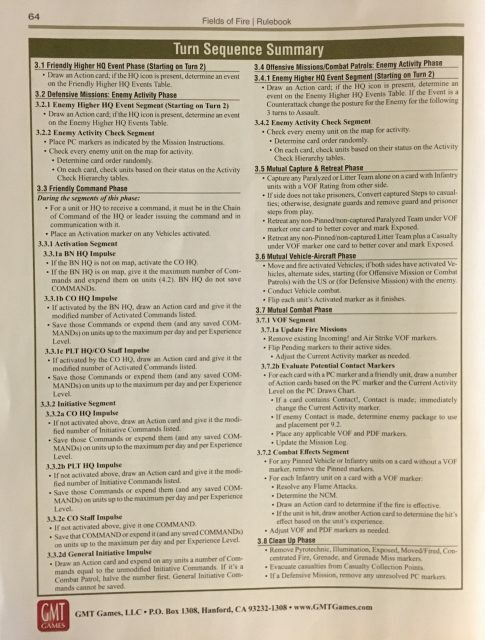 When I heard GMT was actually putting out an update kit for owners of the first edition, I shouted “shut up and take my money!”, put an order in, and promptly forgot about it. And now here on my doorstep were the new rulebooks, charts, and counters. The question was: would I be able to boot up my internal memory (now almost ten years dormant) and play? The answer, thanks to the new-and-improved rules reorganization, was “yes”–to my relief. Sure, I spent a lot of time at first flipping back and forth re-familiarizing myself with rules, but it all came back to me more easily than I’d hoped. With the help of a new (and better) example of play, I was able to dive into the first Normandy scenario again. My guys were pinned down by a heavy machine gun nest in the woods in front of Trevieres, and suddenly I get word on the Battalion radio that there’s trouble on the flank, so no advancing until I got the all-clear from the HQ. Nuts! I had to wait it out, meanwhile my poor 2nd platoon took a shellacking before I could move my mortars into position to pound Jerry’s position and send in another platoon to clear out the other German squad sitting pretty in foxholes cutting down my guys in a wicked crossfire. I was lucky I had a Jeep and a litter team that were able to evacuate the casualties. As you can see, Fields of Fire plays out in a tense and gripping narrative that’s a page out of Saving Private Ryan–at least for the WWII scenarios. I never did understand the Vietnam-era Helicopter rules, so I’m hoping to try out some of those scenarios and see whether they’ll be like Full Metal Jacket or more like Rambo II. 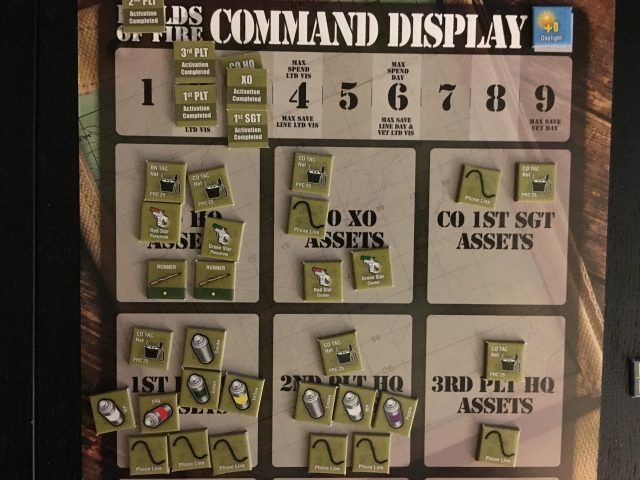 The incredible scope of Fields of Fire is its biggest selling point, and now that the rules have been ironed out and with a standalone sequel in the works (this time following a Marine company), you might want to invest the money and time in the game–now give me twenty, maggot!